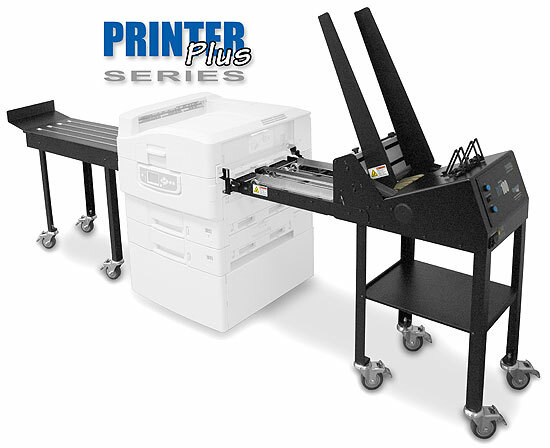 Introducing the new Streamfeeder PrinterPlus Series RT-100 Feeder System. The system includes a specially designed top-load friction feeder and high-capacity shingling conveyor that can be integrated to an Okidata Laser Printer (speed and capacity based on printer specifications). The Streamfeeder Product Line is a proven and recognized industry leader of patented friction feeding technology. Streamfeeder feeding solutions can be found in the largest and the smallest print facilities worldwide. The affordable Streamfeeder RT-100 improves productivity by enabling continuous production and quick changeovers of envelopes, letterhead, business cards and more.